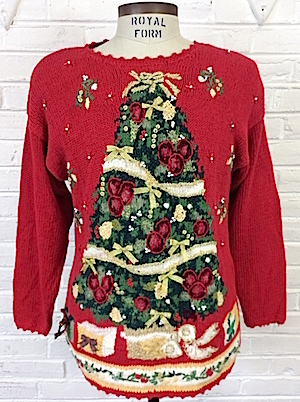 A horribly ugly-awesome Christmas tree adorns this rich red Tacky Christmas Sweater! Red background with a huge fancily decorated tree on the front, with sparkly gold-tone ribbons and threads in the garland and bows. GLITTERY GOLD BOW! Oddly coloured presents under the tree, and floating sprigs of what look like mistletoe surround it. Red beads and faux pearl beads. Bottom front band with xmas flora embroidery. Made by Maggie Lawrence. Ramie/cotton. Condition: Good++: Has a mediums sized hole/gap in the lower portion of the sweater. Also has a few missing beads and loose threads. Still an amazing Xmas sweater! priced accordingly. Sleeves: 30" collar to cuff. 3/4 length sleeves.